Nam Montr – Nam = Water, Montra = Prayer. Nam Montr is the name given to Holy water, or Magically empowered water. Nam Montr is kept and empowered in a special receptacle called a ‘Khan Nam Montr’, which exist in a multitude of Forms, Specialized purposes, and Artistic Interpretations. The Khan Nam Montr is used for meditative Empowerment methods as well as Incantation and Prayer as a method of Transference of Power. Kasina Staring, Candle magic, and the use of added ingredients and sacred objects immersed in the holy prayer water are used as a magical fusion method to increase and amplify the power of the holy prayer water. The water is used to spray on devotees and any objects considered worthy of Blessing. You can make prayer water in a multitude of ways. 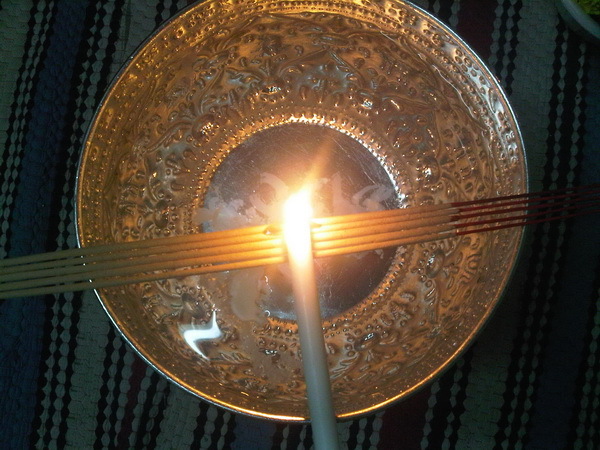 Making Water by Prayer and Incantation – By lighting incense, candles and giving offerings, and then performing preliminary prayers, and then Incantations (Kata Chanting), whilst focusing on the Prayer Water. The object of the chanting is not only to magically activate the prayer/holy water, but also to generate an increased focus (Samadhi) in the mind of the practitioner, which in turn increases the psychic effect of the empowerment process in an ever increasing scale as the practitioner becomes ever more fluent with repeated practice. You can also use sacred items such as magical substances, or amulets to empower the water within the Khan Nam Montr. In the case of Khan Nam Montr which are designed and empowered with a particular Deity, such as Brahma, Vishnu, or Pra Upakut Buddha, then you can use the commonly used incantations and Bucha methods for that Deity , to make a specialized form of Prayer water which carries the qualities and blessings of that particular Deity. You can however with such items also make other forms of prayer water, with the exception of any kinds which may disagree with the innate nature of the Deity present within the Khan Nam Montr. ‘Chae Nam Montr’ (Empowering Items by Immersion in the Khan Nam Montr). You can increase the power of both the Nam Montr (prayer water), and your amulets, by immersing them (if the amulet is immersible) in the Khan Nam Montr, and performing Bucha and Incantations, then removing the amulet when needed. Many Pra Somdej and other famous amulets receive this extra treatment when produced by Great Masters, as a method of increasing power and sacredness of amulets. The Badtr Nam Montr/Khan Nam Montr is also usable as an ‘Apo’ Kasina Meditation Object. Apo Kasina, is the practice of Absorption Staring of the Water Element both Externalized and Internalized (alternately), to attain both inner awakening of powers and realizations, purification of Inner Vision, and Elemental Control over Mind and Matter. The practice of Prayer Chanting to Empower the Holy water in combination with the Psychic Empowerment of Kasina Staring and the Kundalini Awakening which arises from the Kasina practice, can only serve to Increase the extent of the Empowerment. This two faceted applied method of Empowering Holy Prayer Water is recommendable to all Advanced Practitioners, and even Intermediates. You can use candles and incense too for making Holy Buddhist prayer Water. There are various methods which are applied to achieve this and various techniques depending on the dogma of the linage method. One popular method and very rapid method is that of using the ritual knife (mitmor), or ritual dagger (Grich/Keris), to stir the water whilst performing incantations. This, is usually performed in conjunction with the use of magical candles, which are late and balanced on the edge of the holy water bowl. The waxing strips from the candles as they burn and dropped into the water often forms abstract shapes which are interpreted as lottery numbers are lucky numbers of speeches or inauspicious numbers sometimes they may foremother shapes which may tell something to the person making the determination of the future of lucky or unlucky for tunes which one should Watch out for, or beware of. We shall be publishing various other methods and techniques for making holy water, as soon as we have more time for doing this as we develop this section.